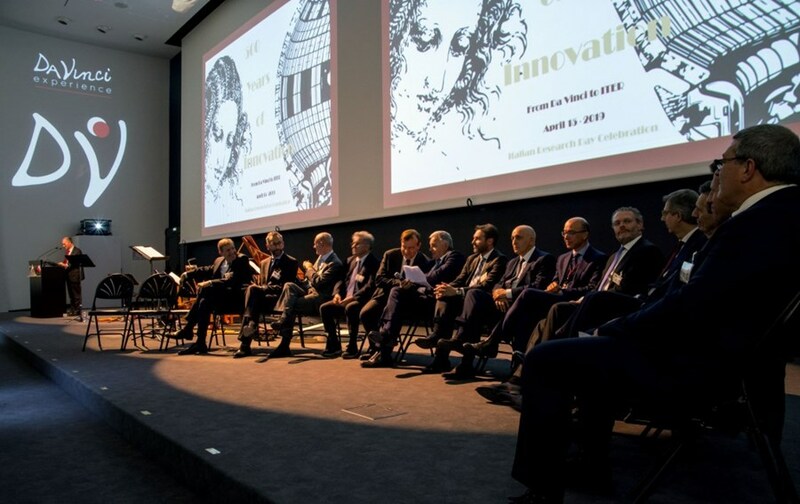 To the members of a panel on innovation and Italian leadership, the moderator had one question: how do you see Leonardo da Vinci's scientific method—a systematic approach to observation, analysis, knowledge and learning—translating to modern scientific discovery and industrial applications including ITER? The panel, moderated by ITER's Sergio Orlandi (Head of the Plant Engineering Department, seated sixth from left), was composed of leaders of Italian university programs and research institutions, and heads of industry. "I think Leonardo might have been very interested in whether humankind can achieve the dream of generating fusion power in a machine," said Massimo Garribba, from the European Commission's Directorate-General for Energy, who opened the panel discussion. "He was a dreamer himself: he designed flying machines and much more." Painter, musician, writer, anatomist, draftsman, scientist, architect, engineer, designer ... Leonardo da Vinci's ability to draw on all of his skills to create—whether a novel device or a perfectly proportioned anatomical drawing—is a model for problems as complex as fusion. "Here at ITER we want to take the power of the Sun and bring it down to Earth and the solution we propose relies on almost every field of science (plasma physics, materials science, engineering, electronic control systems...)." The panelists came from two distinct but related worlds: the theoreticians—leaders of Italian university programs and research institutions—on the one hand, and the practitioners—heads of industrial enterprises, large and small, in fields relevant to ITER—on the other. Building on the moderator's question, they drew two other parallels between Leonardo's genius and the research and development that is underway around the world today, both inside and outside of the ITER Project. Leonardo used the equilibrium he observed in the natural world (through proportion, numbers, and measurements) in all of his artistic and scientific creations. This same equilibrium, panelists agreed, should inform the quest for low-carbon, sustainable energy in order to arrive at a solution that maintains balance in our climate, our relationship with Nature, and among ourselves. And parallels can be drawn between the transition—or rebirth—society is going through as we collectively try to transform our habits into a more sustainable form of living, to the Renaissance period sparked by Leonardo da Vinci and others that transformed nearly all facets of European culture and society. Leonardo da Vinci was interested in learning not only for learning's sake, but for the way creativity and innovation and devices and machines could improve lives. However for the modern inventor who shares Leonardo's goal, the innovation environment has changed. "We are no longer living the Renaissance model of the solitary scientist; we have interlinking systems of research around the world," said Umberto Minopoli, president of the Italian Nuclear Association. "In today's world we need global solutions for the big scientific questions we are facing." As keynote speaker Marco Ricotti concluded, "During Leonardo da Vinci's time, one genius was enough for thousands of machines. Here at ITER, we need thousands of scientists and engineers for one machine ..."